© 2011 – 2013, Edward Champion. All rights reserved. Hi Thanks for making a list of local independent bookstores. I was wondering if you could add my store to the list. It is The Village Bookstore 8140 Main St. Garrettsville Ohio 44231. It is about 35 miles from Mentor, Ohio. Also the Joseph Beth Bookstore at Legacy Village sadly closed in Dec. Thanks. Another alternative to the closing Florida Borders stores is our favorite independent bookstore, Poe House Books 823 NE 5th St, Crystal River FL 34429. Unparalleled customer service and traditonal bookstore feel. Great idea and list. Though Green Apple Books is a few miles from the two Borders closing in downtown San Francisco, it is a worthy alternative. See reviews on Yelp for proof. Thanks! In case the list is being revised, please include Alamosa Books as one of the Albuquerque alternatives. We celebrate our one year anniversary in April, and consider ourselves a viable alternative to filling the void left by the closing of one of the local Borders. Thanks for shedding light on this issue for us. Please include Alamosa Books as an alternative to the Albuquerque, New Mexico closure of Borders. We celebrate our one year anniversary in April, and look forward to being a part of the community for many years to come. Joseph-Beth, 24519 Cedar Road, Lyndhurst, OH 44124 (15.6 miles) has closed. Thanks for the valuable work you’re doing for us book lovers. 37 year old independent feminist bookstore. There’s another book store in Tampa. For Borders Bookstore #171, there’s an independent book store about a block away: Book Swap of Carrollwood. http://www.bookswapfl.com/ at 13144 North Dale Mabry Highway, Tampa, FL. I just opened a new and used bookstore in downtown Fostoria Ohio. Adventures in Books LLC. The address is 125 South Main Street, Suite 201. Thank you for gathering and publishing such an extensive list of bookstores. As a 22 year Borders employee that was let go last year during the wind-down of reorganization, it is heartening to see that books are still available for purchase in so many places. To the retail outlets listed, I would encourage people to get a library card and support their local libraries by checking out books, sorting donations and working at library book sales. This will allow those who can’t afford to purchase books the opportunity to read and benefit from them. Your list also deeply wearies me. During my time with Borders, I travelled to many of these stores, trained many of the managers, answered many of their calls, walked with them through the May ABA Vendor Expos. The lists aren’t just stores that are closing, they are the faces of employees who are losing jobs they love, and the long attempt to find another as fulfilling in a very difficult economy. Please, continue to support the Borders that remain open. Please see, when you pass by the shuttered shops or enter the ones still open; the staff are not “faceless corporations, but passionate book lovers who very often read the books they stock.” Your quote is just as apt for your neighbors, Borders store employees, as they are of their independent partners. There’s also Cary Books–they said mainly used, but have anew book section as I know i’ve signed there and they keep my books in. They can also order books for you, I’m pretty sure. Thanks for this great list! Can you add us to the alternatives for the King of Prussia, PA Borders? This made me laugh. The Tattered Cover is in Highlands Ranch. We have very few beaches in Colorado. Thanks for the list. There’s one you missed in Connecticut. Its the Rainy Day Paperback Exchange located at 81 Greenwood Ave Bethel, CT 06801. Not sure how you missed us but the Garden District Book Shop is only 6 blocks from the Borders closing in New Orleans and we’ve been at our location for 30+ years. Here’s another to add in Pittsburgh: Awesome Books, 5111 Penn Ave., Pittsburgh, PA 15224. As an alternative to Borders Bookstore #490 in Chapel Hill, NC, the Bull’s Head Bookshop on the campus of UNC-Chapel Hill is the largest independent trade bookstore in Chapel Hill, and has been in operation since 1925. Chapters A Literary Bookstore no longer has a physical store in Washington, DC, though it continues to sponsor events. An indie alternative to the Borders store at 1801 & L STS, NW is Kramerbooks and Afterwords, 1517 Connecticut AV, NW. Kramerbooks is just north of Dupont Circle and about 1/2 mile from the Borders store. Joseph Beth in Lyndhurst, Ohio is closed. I really appreciate what you have done here by listing the bookstores that are close to the closing Borders stores. I especially appreciate the fact that you included my store: Bay Books in San Ramon, California. I will Tweet and Facebook this link. One of the Austin locations you mention (Bookwoman) is in Nashville, not Austin. No mention of Bookpeople, either? It’s a locally-owned full-service bookstore. I don’t see Roseville or Sacramento in California. Many used book stores regularly sell almost new books, and some will order new books. In my experience, all of the stores I have visited have been very friendly and helpful, even when answering questions over the phone about book availability and price. Beers Books, 915 S Street, Sacramento – (916) 442-9475 (Used Books). Time Tested Books, 1114 21st Street, Sacramento – (916) 447-5696 (Used Books). On the Indianapolis list: Sadly, Outward Bound closed its doors (in 2009, I think). Also, you should include Kids Ink, 5619 N. Illinois, Indianapolis, IN 46208 317-255-2598. It’s nearing its 25th anniversary as Indianapolis’s best children’s bookstore. Don’t forget about I Said Read Me! in Tamaqua Pennsylvania. thanks for such a great list.. Your source omitted the Borders in the Atrium Mall in Chestnut Hill, MA. Its indie replacements are Newtonville Books, 296 Walnut Street, Newton, MA 02460, and the almighty New England Mobile Book Fair, 82 Needham Street, Newton, MA 02461. Our downtown Borders on State Street in Santa Barbara closed, and the ever awesome indie Chaucer’s Books is a mere 2.7 miles away. Unfortunately, the Mystery Bookstore in Los Angeles has closed. However, the independent bookstore where I work, Diesel A Bookstore, is 6 miles away from the closed Borders on Santa Monica Blvd and has already been visited by previous Borders customers. I would greatly appreciate it if you included us in your list! In particular, Fields Books, Kayo, William Stout, Chronicle Books, etc. Just wanted to point out that, in your list of indies in Austin, TX, you gave the URL for Bookman/Bookwoman in Nashville, TN, when you meant to use this one [http://www.monkeywrenchbooks.org/] for MonkeyWrench Books in Austin. But thanks for the other great recommendations! And BTW, you might also want to mention 12th Street Books in Austin [https://www.12thstreetbooks.com/index.php/] which, while it’s a true indie, carries mostly “books on diverse subjects but specializing in literary first editions, fine bindings, small-press books, and books by and about Texas writers.” I haven’t been there yet, but my sister knows the owner — so I figure it must be okay! Thank you for taking the time to do this! Huge kudos to you. I have a correction to the Gig Harbor, Washington store. The mileage you have listed is way off and I realized that is because you have the Gig Harbor zip code listed as “98355” when it is actually “98335.” King’s books in phenomenal by the way, I was very glad to see that on there. 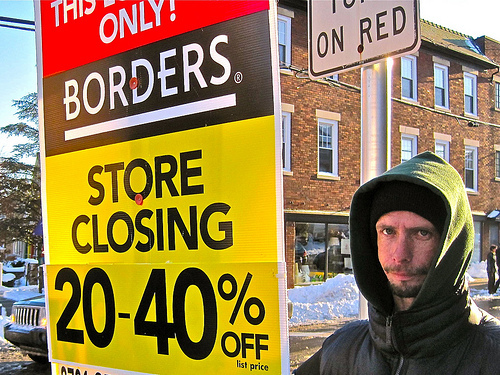 The Borders at 1539 East 53rd Street, Chicago, IL 60615, (773) 752-8663, is also closing. I was out of the country when all this went down, but I just want to give a huge thanks to you for the work that went into this, and for caring enough to do it. VERY close to the old Borders. And their BOGO months are awesome! Thank you so much for letting me know about Weekend Reader in Balch Springs. That store is only a few miles from my house – closer to me than Borders was, actually! – and I had no idea it was there. I’m so thrilled to find this store, as Paperbacks Plus is mostly used books, and the only other bookstores I was aware of in the area were either used book stores or Christian book stores. Somehow I doubt LifeWay is going to be willing to stock my favorite werewolf urban fantasy series. Joseph-Beth, which is listed as an alternative to the Borders in Mentor, OH is also closed, sadly. Okay, folks, I’ve gone through all of your comments and added your bookstores (up until this comment: please note, future Ed!). My apologies for the delay. I’ve been overwhelmed by the response. What’s most helpful is if you can tell me what specific Borders your store is serving as an alternative to. For people who weren’t added, I have emailed for additional clarification. I will try to sort out the mileage situation on some entries later. I felt the most important thing to do was to get the stores listed. Also, while I’m sure it would be pain to list them all, it should be noted that the library is also an excellent alternative. All *three* of the "closest independents" are in North Austin — far from normal ranging ground for anyone down here. Oh and the Southpark meadows location is even FARTHER south. It'd probably be closer to go to Kyle for a bookstore than Round Rock — it would certianly be faster once you take into account Austin traffic. Some Borders stores closed leading up to the announcement, including the one here in Bloomington, IN. We have several fine alternatives including Howard’s Bookstore and The Book Corner, not to mention several stellar used book stores. The one in Syracuse, NY probably did not make the list because it was closing before the announcement was made. I made a list on my blog ( http://www.mariminiatt.com/2011/01/why-i-am-not-crying-over-borders.html ) of some of the stores in town that were alternatives. I only touched the tip of the iceberg. One major one I left off was the SU bookstore. Here’s a list of independent booksellers in Vermont. http://www.yelp.com/biz/seize-the-time-books-and-videos-marietta-Seize the Time Books and Videos is a great book store in Marietta Ga that carry lots of books by mostly black authors. They are on yelp.com at the above address. 702 N. Midvale Blvd. It’s practically across the street from the closing Borders store. Another alternative to the closing Borders in Ithaca NY: Buffalo Street Books in the DeWitt Mall between Cayuga and Tioga Streets. About to take brief transitional nap before reopening as a community run cooperative in April. Support union workers – Shop union! ILWU Local 5, the union that represents Powell’s workers, is asking you to show your support. On Tuesday, March 8th, we invite everyone to join us for a shop-in at Powell’s online store. by the recent layoffs at Powell’s. Powell’s Books: the best independent unionized bookstore on the planet. Make Powell’s your new, used AND ebook store of choice! For the Borders 564 in Chicago on North Ave, about a mile west are 2 indies. Uncle Hugo’s is the oldest independent Science Fiction bookstore in America. For sci-fi and mystery fans, these stores are the BEST. If you lived in my area–Columbus, OH–you would understand that none of these shops is an acceptable substitute for Borders. Also, the two stores listed are quite close together, both clustered in the northwest corner of the city. The Book Loft is large and carries a wide selection, but it’s also rambling, requires a map, and does not have the same kind of community feel (in terms of being a gathering place). Most of the other shops are storefronts. Few have a respectable selection of periodicals. Furthermore, few of them are actually located convenient to the neighborhoods that Borders serviced. Most are on the main drag (High Street) and several are much closer to downtown. Several of the stores you’ve listed pull at least part of their stock from the local Half Price Books’ clearance department (I used to speak to Karen Wickliff regularly; she seemed like a nice lady). Half Price Books on Lane Avenue is probably the closest to Borders outside of Barnes and Noble, but believe me when I say that the only thing these proposed replacements have in common with the two stores that are closing is that they all sell books. As an alternate to the Borders Bookstore #362, I think Mysterious Galaxy Books is the best independent bookseller in San Diego, CA, even if it’s a bit of a drive from the 6th Ave Borders location (maybe a 15 minute drive). Of the other bookstores listed as alternates two are focused on used books rather than new. Mysterious Galaxy is all new books as far as I know. Also in York, PA, about 21 miles from Camp Hill Border’s store #455 is Recycled Reader Used Book Store at 1212 East Market St., about one mile west of Route 83. My wife and I have just recently opened this independent used bookstore in historic Winter Garden, a close alternative to Borders #254 in Ocoee and Borders #279 in Orlando. We sell like new, pre-owned, and collectible books. You can also purchase books online through our website. Thanks for all the hard work that has gone into the list. If you can add us to the list for alternatives for any Metro Atlanta store, that would be great. We are closest to store 298 but also are close to #411 for many of their shoppers. We would love to see more faces at our store and also would love to extend a hiring opportunity to displaced employees. http://www.thebookwormonline.com is our contact info. Secret Passages has moved to Costa Mesa, but we (A Castle of Books) are located at 4302 Atlantic Ave, in Long Beach, CA 90807. Not perhaps a direct substitute since we are predominantly a used book store, but certainly we can supply a great deal of reading material. I just wanted to let you know that there is a bookstore in long beach on Pine Ave. It’s next to the startucks and is also a dollar bookstore. The address is 248 Pine Ave.
Maybe you want to include it on your list. I go there all the time. They have a nice variety of books and all are for a dollar. Good bargain to promote. Unfortunately, the Joseph Beth Books branch in Lyndhurst, OH is closed.